Having recently registered for the eAssessment Scotland conference I was reminded that last year I learnt a new word there: ipsative assessment. This is a nice summary on the subject from John Kleeman. 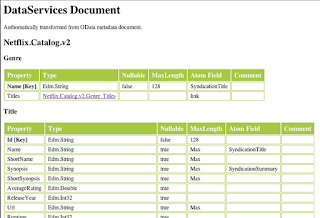 In a recent post I talked about work I've been doing on OData. 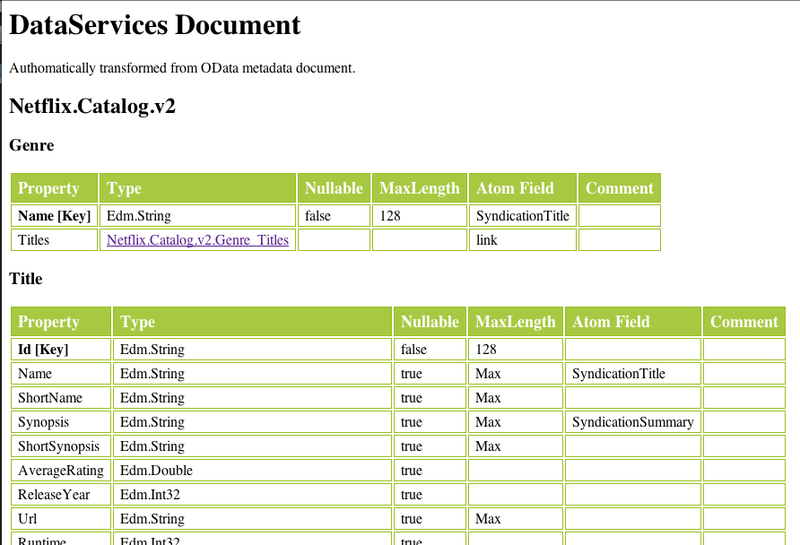 See Atom, OData and Binary Blobs for a primer on Atom and some examples of OData feeds. In a nutshell, OData adds a definition language for database-like Entities (think SQL tables) to Atom and provides conventions for representing their properties (think SQL columns) in XML. Their definition language is based on ADO.NET, yes they could have chosen different bindings which would have made more work for their engineers, less for the rest of us and improved the chances of widespread adoption. But it is what it is (a phrase I seem to be hearing a lot of recently). To see what this might look like in the real world you can also look at the $metadata document published as part of the Netflix OData service I used as the source of my examples last time. Now there is an issue here. One of the things that I've commented on before is the annoying habit of specification writers to change the namespace they use when a new version is published. I can see why some people might do this but when 90% of the spec is the same it just causes frustration as tools which look for one namespace have to have significant revisions just to work with a minor addition of some optional elements. As a result, I've published two versions of the XSLT that I used to create the above picture. If somebody out there knows how I can do all of this in one XSL file without lots of copying and pasting I'd love to know. The first xslt uses the namespace from CSDL 1.1 and can be used to transform the metadata from the sample OData service published by Microsoft. The second xslt uses the namespace from CSDL 2.0 and must be used to transform the metadata from Netflix. If you get a blank HTML file with just a heading then try the other one. When clicking on these links your browser may attempt to render them as HTML, you can "View Source" to see the XSLT as plain text. This transform could obviously be improved a lot, it only shows you the Entities, Complex Types and Associations though I am rather proud of the hyperlinking between them. Launching learning activities with AICC CMI-5: GET or POST? With the AICC working on a new specification to update the existing use of the CMI data model and replace the ageing (but still popular!) HACP it seems like a good opportunity to fix the concept of launch via a web browser to harmonise learning technology standards with best practice in mainstream applications. By the way, if you are curious HACP is defined in the 1993 document: [CMI001] CMI Guidelines for Interoperability AICC. The Learning Management System (LMS) typically does the launch by creating a special page that is delivered to the user's web browser containing a form (or a naked hyperlink with query parameters) to trigger the activity in a remote system. There are some subtle things going on here because best practice in HTML has been based on the assumption that the server that generated the form is the one that will receive the submission whereas our community tends to rely on cross-site form submission (XSFS perhaps?). Anyway, you can read my recommendation to the AICC in the open forum created by them to discuss the CMI-5 draft specification. And of course, if you haven't had a look yet I'd encourage you to have a quick look over the specification yourself. The more people review and comment on these documents the better. The topic I just started with my new proposal on how the LMS should launch a learning activity in future. I'm recommending that the POST method is used with GET supported for backwards compatibility only so if you support AICC standards please read and review my proposal because you might have to do some work on your launch code to support CMI-5 if my proposal is accepted. You can download the full specification as a PDF from here. About this time last year I wrote a blog entry on installing wxPython and py2app on my Mac running Snow Leopard. Well I have since upgraded to Lion and the same installation seemed to keep working just fine. This weekend I've actually upgraded to a new Mac and I thought this would be an excellent opportunity to grapple with this installation again and perhaps advance my understanding of what I'm doing. Apple's Migration Assistant (a.k.a. Setup Assistant) had other ideas. You have to hand it to them, it took about 2-3 hours with the two machines plugged together and everything was copied across and working without any intervention. They really do make it easy to buy a new Mac and get productive straight away. So is this blog post the Python equivalent of the "pass" statement? Just a no-op? Well not quite. At the moment, I'm building my QTI migration tool using the Carbon version of wxPython which means forcing Python to work in 32bit mode. That's getting a bit out-dated now and I surely can't take advantage of my new 8GB Mac? I need to embrace 64bit builds, I need to figure out how to build for the Cocoa version of wxPython and I need to figure out how to do this while retaining my ability to create the 32-bit build for older hardware/versions of Mac OS. Thanks to How to tell if my python shell is executing in 32bit or 64bit mode? for the tip on printing maxsize. Firstly, note that the Mac binaries install in /Library/Frameworks/ whereas the pre-loaded Apple installations are all in /System/Library/Frameworks/. This is a fairly subtle difference so a little bit of concentration is required to prevent mistakes. Anyway, as per the instructions above I restored my .bash_profile from .bash_profile.pysave and confirmed (as above) that I was getting the Apple python. This might be enough, but the wxPython home page does recommend that you use different python installations if you want to run both the Carbon and Cocoa versions. So I'll repeat the installation with a python 2.6 build. The current binary build is 2.6.6, this is missing some important security fixes that have been included in 2.6.8 but it looks safe for the migration tool. I downloaded the 2.6 installer from here. When I ran the installer I made sure I only installed the framework, I don't want everything else getting in the way. Notice that this is a 32-bit build. Apple actually ship a 64-bit build of 2.6.7 so care will be needed, typing python2.6 at the terminal will not bring up this new installation. This is going to come in very handy in the next step. setuptools is required by lots of Python packages, it is designed to make your life very easy but it takes a bit of fiddling to get it working with these custom installations. It's an egg which means it runs magically from the command line, I'll show you the process of installing it on python 2.6 but the instructions for putting it in 2.7 are almost identical (it's just a different egg). then exec python2.6 -c "import sys, os; sys.path.insert(0, os.path.abspath('$0')); from setuptools.command.easy_install import bootstrap; sys.exit(bootstrap())" "$@"
echo $0 is not the correct name for this egg file. echo Please rename it back to setuptools-0.6c11-py2.6.egg and try again. I've only shown the top 8 lines here, the rest is binary encoded gibberish. The thing to notice is that, on line 3 it invokes python2.6 directly so if I want to control which python installation setuptools is installed for I need to ensure that python2.6 invokes the correct interpreter. That's where my local bin directory and path manipulation comes in handy. Now for me, and anyone who inherits my $PATH, invoking python2.6 will start my custom MacPython install. wxPython is a binary installer tied to a particular python version. However, I believe it uses a scatter gun approach to search for python installations and will install itself everywhere with a single click. That is the reason why it is better to run completely different versions of python if you want completely different versions of wxPython. In fact, if you find yourself with multiple installs there is a wiki page that explains how to switch between versions. But a little playing reveals that this refers to Major.Minor version numbers. It can't cope with the subtlety of switching between builds or switching between Carbon and Cocoa as far as I can tell so this won't help us. (If, like me, you are upgrading from previous installations you may have to clean up older builds here.) At this point I tested my wxPython based programs and confirmed that they were working OK. I was impressed that the Cocoa version seems to work unchanged. With the groundwork done right, the last step is very simple. The symlinks we put in for easy_install make it easy to install py2app. The plot is very similar for python 2.7. The suffix is then appended to the name passed to the setup call itself. The following command results in a 32bit, Carbon binary, compatible with OS X 10.3 onwards. While this command creates a Cocoa based 64bit binary for 10.5 and later. And that is how to target both Carbon and Cocoa in your wxPython projects. I've been doing a lot of work on Atom and OData recently. I'm a real fan of Atom and the related Atom Publishing Protocol (APP for short). OData is a specification from Microsoft which builds on these two basic building blocks of the internet to provide standard conventions for querying feeds and representing properties using a SQL-like model. Given that OData can be used to easily expose data currently residing in SQL databases it is not surprising that the issue of binary blobs is one that takes a little research to figure out. At first sight it isn't obvious how OData deals with them, in fact, it isn't even obvious how APP deals with them! Most of us are familiar with the idea of an RSS feed for following news articles and blogs like this one (this article prompted me to add the gadget to my blogger templates to make it easier to subscribe). Atom is a slightly more formal definition of the same concept and is available as an option for subscribing to this blog too. Understanding the origins of Atom helps when trying to understand the Atom data model, especially if you are coming to Atom from a SQL/OData point of view. Atom is all about feeds (lists) of entries. The data you want, be it a news article, blog post or a row in your database table is an entry. A feed might be everything, such as all the articles in your blog or all the rows in your database table, or it may be a filtered subset such as all the articles in your blog with a particular tag or all the rows in your table that match a certain query. Obviously the first feed contains all the entries in the second feed too! For blog articles, this content is typically html text (yes, horribly escaped to allow it to pass through XML parsers). Atom actually defines three types of native content, 'html', 'text' and 'xhtml'. It also allows the content element to contain a single child element corresponding to other XML media types. OData uses this method to represent the property name/value pairs that might correspond to the column names and values for a row in the database table your are exposing. Notice the application/xml content type and the single properties element from Microsoft's metadata schema. There is nothing stopping the content of an entry from being a non-text binary blob of data. You just change the type attribute to be your favourite blob format and add a src attribute to point to an external file or base-64 encode it and include it in the entry itself (this second method is rarely used I think). Obviously the URL of the entry (the XML document containing the <entry> tag) is not the same as the URL of the media resource, but they are closely related. The entry is referred to as a Media Link because it contains the metadata about the media file (such as the title, updated date etc) and it links to it. The media file itself is known as a media resource. There's a problem with OData though. OData requires the child of the content element to be the properties element (see example above) and the type attribute to be application/xml. But Atom says there can only be one content element per entry. So how can OData be used for binary blobs? This entry is taken from the Titles feed, notice that the entry is a media-link to the large box graphic for the film. There is no reason why binary blobs can't be XML files of course. Many of the technical standards for education that I work with are very data-centric. They define the format of XML documents such as QTI, which are designed to be opaque to management systems like item banks (an item bank is essentially a special-purpose content management system for questions used in assessment). So publishing feeds using OData or APP from an item bank would most likely use these techniques for making the underlying content available to third party systems. Questions often contain media resources (e.g., images) of course but even the question content itself is typically marked up using XML, as it is in QTI. This data is not easy to represent as a simple list of property values and would typically be stored as a blob in a database or as a file in a repository. Therefore, it is probably better to think of this data as a media resource when exposing it via APP/OData.